Colombia’s health authority issued a public health alert after confirming two cases of measles, a disease that was believed to be extinct until mass migration from Venezuela that began last year. The concerns about a possible migration of infectious diseases were raised after two migrant children were found with measles in the northwest province of Antioquia. Hundreds of thousands of people fled Venezuela over the past year to escape an economic crisis that caused much of the country’s public health system to collapse. Colombia’s public health system was already under tremendous pressure due to widespread corruption and has began receiving foreign aid to attend the emergency. “The national and local health authorities are facing cases of Venezuelans who arrive every day, cross the country and end up in different municipalities. We are fighting together to prevent spreading,” said the director of Colombia’s National Health Institute Martha Lucia Ospina. The case of a 14-month-old in Medellin sparked authorities to search 760 homes door to door for people with symptoms of the infectious measles virus. Authorities said they were monitoring more than 100 people who had been in contact with the infected child who had traveled from Caracas to Colombia earlier this month. Another case was reported this weekend of a Venezuelan minor in Santa Rosa del Cabal, in Risarlda province, who had entered the country illegally. Authorities are tracking down persons who shared bus rides with infected persons to vaccinate and check for anyone who may have contracted the disease. 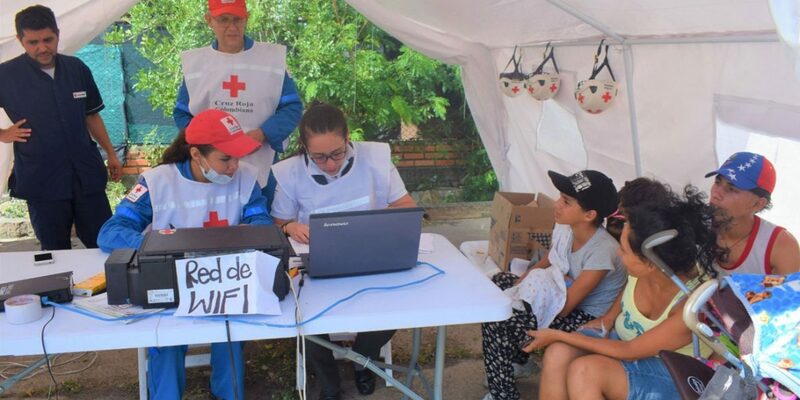 Colombia’s Red Cross also requested a budget increase from its parent organization in response to the growing health concerns of Venezuelan migrants. The International Federation of Red Cross Emergency Appeal on Monday called for $2.3 million to help 120,000 people for 12 months. According to the Red Cross, almost 800,000 migrants traveled to Colombia in 2017. The last time measles was found in Colombia was in 2015. As Colombia’s migration authority has begun stricter border checks, migrants increasingly cross the border illegally, often desperate for food or medicine. The United Nations High Commissioner for Refugees has identified 130 “critical informal border crossings” in La Guajira province, 74 in Norte Santander, and 44 in Arauca, according to the report by the Red Cross. Colombian officials have said over 550,000 Venezuelans are living in the country, and around 37,000 enter each day. The Red Cross report estimates between 2000 and 1000 Venezuelans enter Colombia each day, either to stay or to travel to other countries like Ecuador. “If there is no containment in the border area and the Venezuelan government doesn’t take measures of internal self-control, there will come a time when the spread of the disease can no longer be prevented,” Ospina said. Venezuela has rejected foreign aid.